It's tea time! Using this sweet little tea cup and saucer will be the perfect way to serve tea to your guests. It even comes with a tiny spoon and saucer! At 4oz this tea cup is the perfect size for your afternoon tea or even your morning coffee. The ceramic cup measures at approximately 4" x 2" (including the handle). It is very simple, giving it a modern feel. The handle is big enough to stick a finger through and the saucer (approx. 5.25") is the perfect size for carrying. The little spoon is approximately 5" long with a very dainty neck. This smoothly shaped little spoon is the perfect tool for stirring in your creams and sugars. Not only do they work wonderfully for serving coffee or tea, but they will also look absolutely stunning on display in your kitchen or dining room. 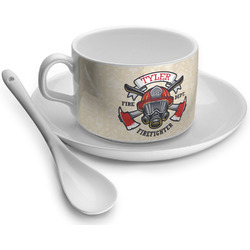 Spice up your tea and coffee accessories with this amazing tea cup! Personalize your cup with the perfect design! The white ceramic makes for a bright background to whatever personalization you decide to add to your little cup. Give your tea or coffee some class! Choose from thousands of patterns and fills in our system to fit your personality! Change whatever elements you like from the text to the ribbons to the graphics. If you ever need help in our design center give us a call or visit our online chat! We are always happy to help you achieve your designing dreams! The design is beautiful but cup is rather small. Tracie was absolutely amazing helping me to customize my order. She was patient and showed me how to get exactly what I wanted on my tea cup. This was a very encouraging first experience with this company! Excellent quality, very pretty and fast shipping.